You are here: Home › Blog › Have 9 Days of Meaningful Conversation around your dinner table! Free! Have 9 Days of Meaningful Conversation around your dinner table! Free! I developed these nifty conversation starters while we were driving home from vacation. I grew tired of the game high/low around our table where we all shared the high of our day and our low. This had become monotonous. 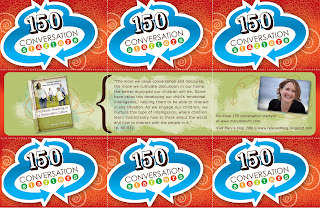 So I came up with 150 conversation starters to jumpstart our family of five’s chatty interaction around our table. The result? It worked! We learned so much more about each other in those 150 days. If you’re interested in having a free sample of nine starters, click here. If that piques your interest, you can purchase all 150 as a download here. So make a (free!) investment in your family dinner times right now. The free starters are here.